A new challenge has me working in something other than paper for the past couple of weeks. Instead I am in the middle of a unique construction project. It all started because my grandson and granddaughter need to share a bedroom but they are of very different ages and personalities. It was clear that a shared room wasn't a great solution so I started thinking outside the box looking for a better solution. 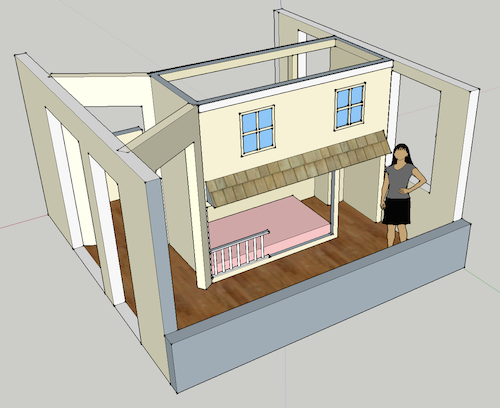 And I created a plan for a bunk bed wall. I designed a structure for the center of the room that extends from floor to ceiling, bunks the beds and includes new walls and doors to make each space private. 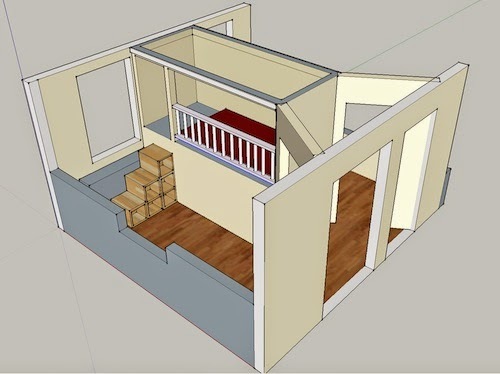 I worked in Sketchup and created the 3D drawing so others could see what I was trying to describe with words and understand how it went together. The bedroom was perfect for this solution because of the location of windows and doors. The two doors (one into the hall and the other into a big double closet) were centered on the same wall. There are three windows well placed so that both bunk rooms have their own window and the space between the windows was more than the width of a standard twin bed. This configuration allowed for the bunk tower in the center. Because the room was longer than the beds I added a cubby at the foot of each bed. I expect it will become either a puppet theater or playhouse on my granddaughter's side and a tree fort or overlook on my grandson's side. In either case it provides an additional space for some creative play. 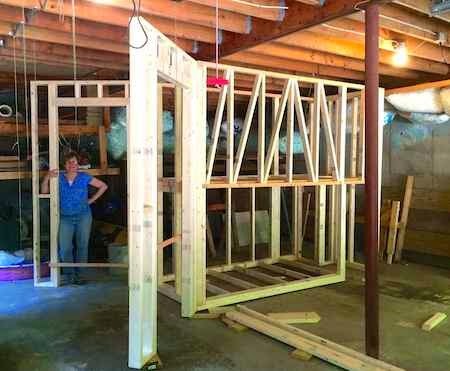 But the most challenging part of this project is that I have designed it to be built in Connecticut in my garage, dismantled and rebuilt in their home in Pennsylvania! In reality, all the framing is being done here. We will do the drywall, spackling and painting in place. But I have the structure complete, all assembled with screws. It will come apart in panels and and fit in our pick-up truck for transportation to PA in the middle of July (I hope!). I'll post more photographs of the progress. I expect it to be quite an experience requiring additional undiscovered problem solving! Vickie, What a wonderful comment to receive. Inspires me to keep blogging and not worry about numbers. This is the closest I'll ever get to a journal and it makes me happy to share. Thanks for taking the time to comment! And more posts coming, I promise! Oh you are a clever lady and what lucky grandkids to have something so wonderful sleep in when they visit.